Does your client need financing in order to realize his plans? Fyndoo Credit Application helps you to set up a structured finance application, whether it concerns a simple or complex structure. With or without substantiated prognoses or annual figures. It ensures you that the application is complete and meets all the requirements that a financier sets. 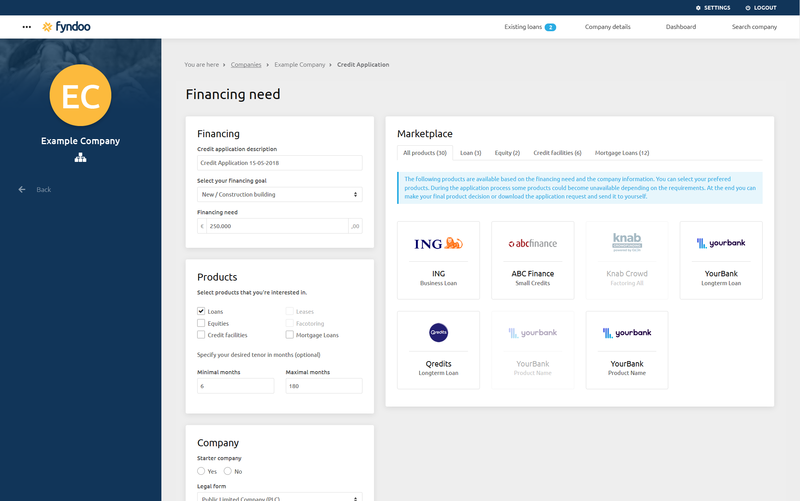 Due to the seamless integration with Fyndoo Marketplace you can easily see which financing solutions are best suitable for your client’s plans and you can directly apply online. The best match is determined based on Knock-Out criteria of the affiliated financiers in combination with the financing goals and needs. The definite choice will always be made by you or your client and after that you can send the application digitally.